– A new take on tactical combat: Combat plays out in real time as a high-speed car chase where you need to position your units and use abilities to maximise their effectiveness. – Exploration pays: You will encounter many different radio signals, each with a text based event. What doesn’t kill you may reward you with loot. – Fully customizable units: Each unit can be upgraded and outfitted with different weapons and abilities, allowing you to customize them to your needs. – A randomized planet: Each play-through features different main and side objectives, events, choices, and different consequences to your actions. – A cold war turning hot: Three factions vie for control over the planet, your actions tip the scales of balance making you an enemy to everyone. As each faction grows in strength, you need to keep up. – Permadeath at the core: Knowing one wrong move could lead to certain death puts you constantly on edge. 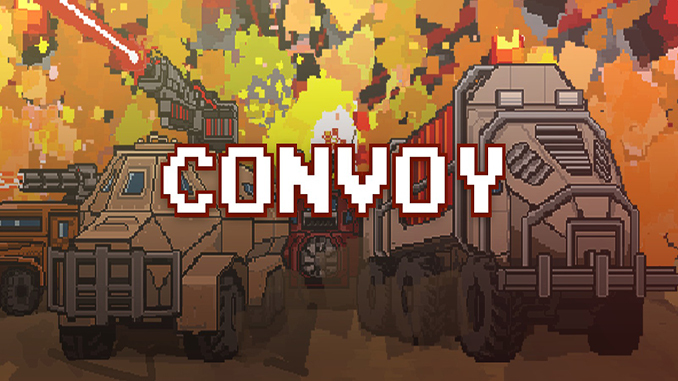 Presented in pixel art and set in a future post-apocalyptic setting, Convoy is a squad based tactical roguelike-like in its core. You travel with your combat vehicles and convoy across a wasteland to find parts needed to repair your broken spaceship.